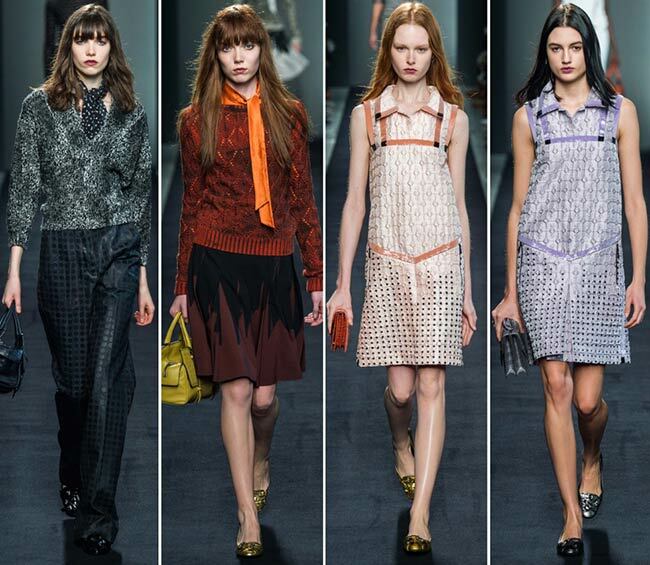 The Bottega Veneta fall/winter 2015-2016 collection presented on the Milan Fashion Week runway today in the morning certainly brought some use of leather, the look appearing to embody that of a snake’s skin, along with leather boots and shoes, but the primary focus was on something else altogether. The geometric lines and the perfection of the polka dots cannot be denied as it is so very pleasing to the mind to see such clean swept designs on the fabrics. 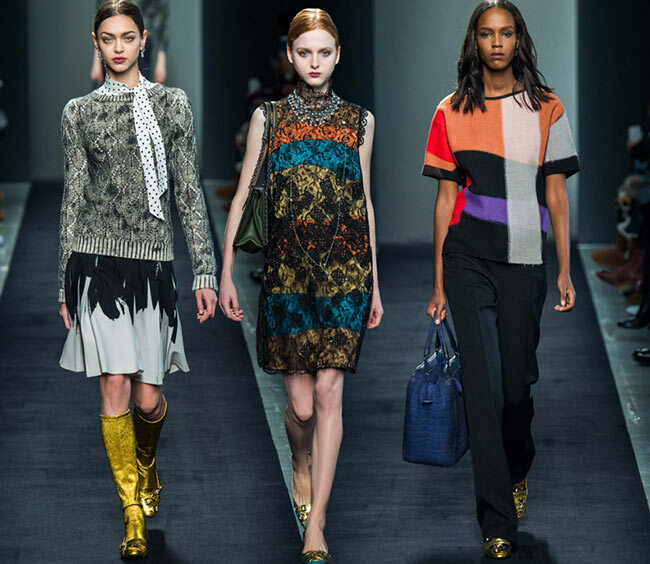 The dots take over the whole of the collection, literally comprising the overwhelming majority of patterns available in the line-up, from colorful vests to bright metallic loose fitting trousers, matching shirts and pants to futuristic style tunic sets. We have them appear in jackets and in plastic looking shiny materials that make up a few variations of skirts in multiple colors. 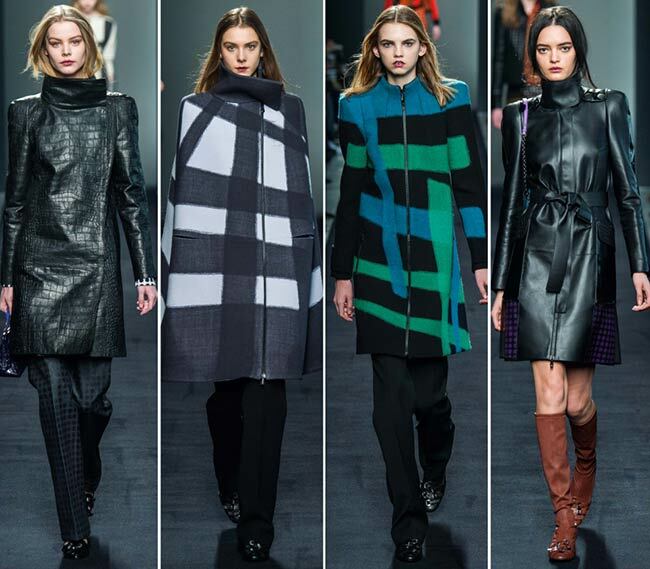 They appear at the edges of leather coats and dresses of different types. The polka dots appear on scarves as well, while the patterning in black and white or navy and white takes up whole outfits, from the shirt to the pants to the matching blazer on the suits. 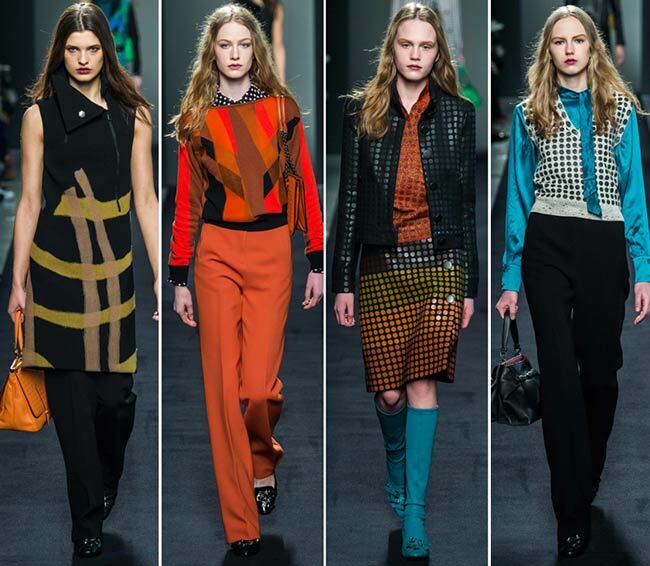 It appears on the tights worn by the models in dresses, as well as on some of the shoes. 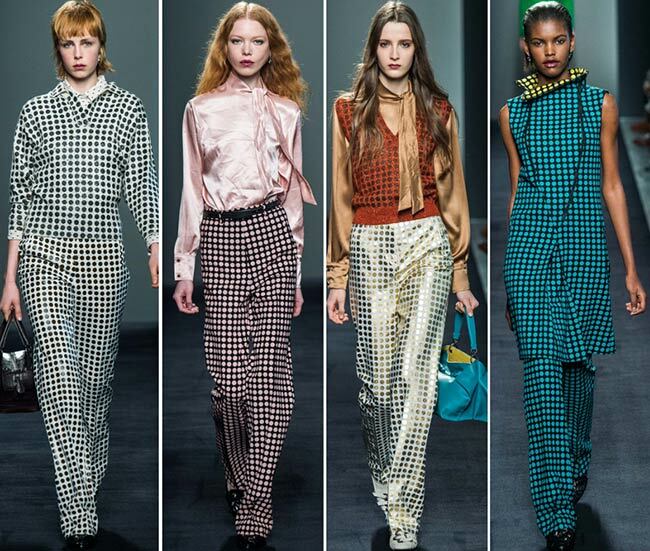 There are polka dots everywhere and it is certainly not the design we were expecting from the Bottega Veneta collection. The name of the brand established in 1966 by Michele Taddei literally means Venetian shop. It has been known for its artisanal leather goods, particularly with the leather waving technique known as intrecciato, a signature of the brand up to this day. The leather working techniques are passed down today through the Scuolo della Pelletteria, wherein the future of the leather artisans is supported by training a whole new generation to play with the material, creating new fashions with the animal hide that will be both utilitarian and positively divine in appearance. 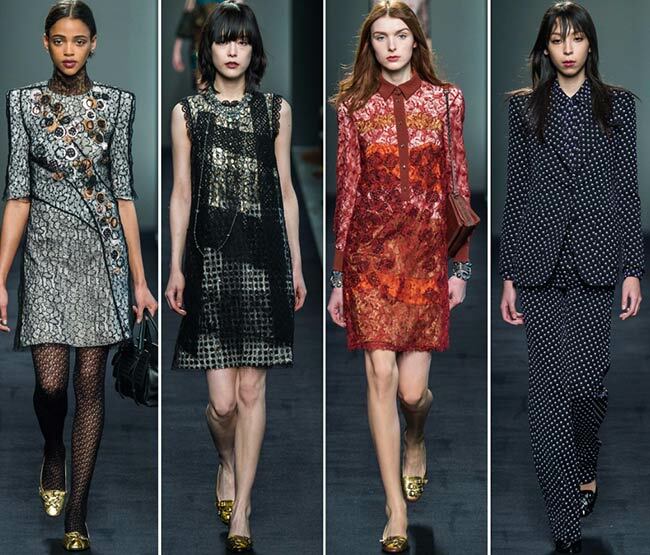 Lucky for those of us who are not major polka dot fans, there are a few pieces in the Bottega Veneta fall/winter 2015-2016 collection that catch the attention that are simpler in designs, including a skirt suit in camel beige, a zip up the side of the thigh and the zip of the jacket askew as well, able to be played with from the top and the bottom of the look. The brown leather handbag completed the look nicely, as did the gold and black flecked pair of flats the feet were clad in. 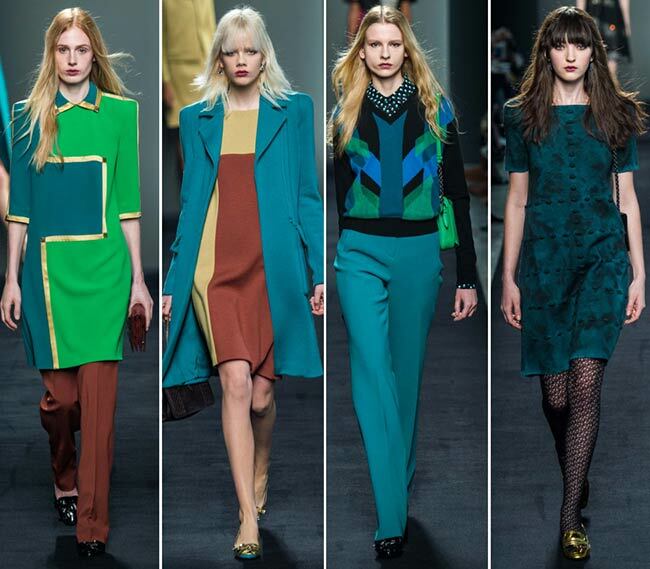 We also have to admit that so many of the colors included in this collection are quite lovely, particularly the blue teal pair of trousers with its matching V-neck sweater in blue, green, and black. The burnt orange coloring of a similar style outfit is also quite interesting, with the autumn colors perfectly embodied in these pieces. On the other hand, the polka dots in the purple, the sky blue, the green and the yellow have us really considering trying out the pattern, just for the sake of wearing those lovely colors. 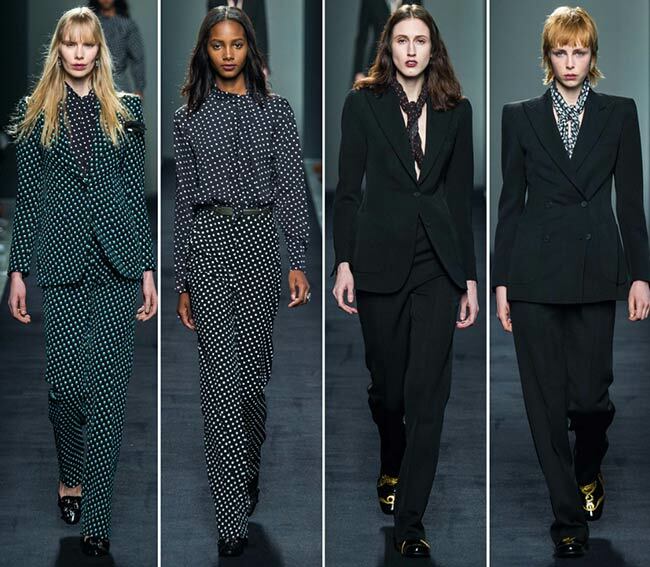 We might even be willing to try out the back and white polka dotted pantsuits, though the more cautious might stick to the black suits with the polka dot scarves around their necks instead.